Clever design solutions for unique residential projects. Both of these homes are designed for a more relaxed, child-free lifestyle—one on the grid, the other virtually independent of it. Three award-winning architects and designers share how they transform a prominent, functional element of the home into a distinct custom look. By stirring the senses of your homebuyers, you’ll leave them with a powerful memory. Here are some unforgettable elevations, rooms, and details. 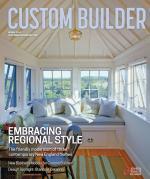 Universal design is the future of home building, says an architect and senior partner of KTGY Group, Inc. When sustainability is a builder’s best practice, the results can be impressive as these custom homes demonstrate. Homebuyers not only value outdoor living space, they have come to expect it. These outdoor environments run the gamut from modest to lavish. Three award-winning designers explain how they approach lighting essentials for a custom-home bathroom, powder room, kitchen, and closet. These four classic architectural styles consistently hit the sweet spot of custom-home buyers. Site characteristics shaped the design of these two houses, which have spectacular views of water, hills, and valleys from every room. These three infill projects are respectful of the surrounding architecture and bring new vigor to long-established neighborhoods. @ Copyright 2017 Custom Builder. All Rights Reserved.